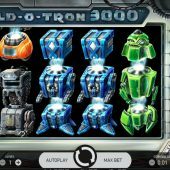 Wild-O-Tron 3000 slot indicates its theme in the name without you even seeing the artwork and correspondingly you'll not be surprised to see robots here and very little else. 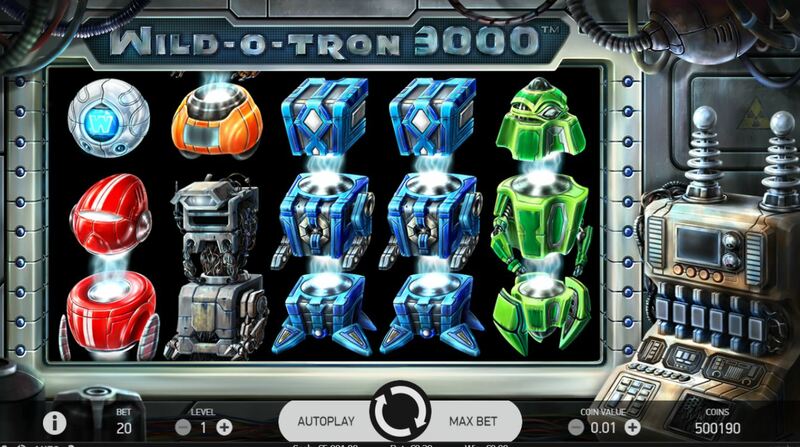 The first game I thought of when seeing Wild-O-Tron 3000 was Playtech's Iron Man 2 which also has just a small amount of different-coloured stacked robots and single Wilds on the reels but alas I shall ruin any anticipation by stating now that this game isn't a patch on Iron Man or Iron Man 2! The music is supposed sound futuristic but merely sounds like an inane mix of the X-Files theme and a dance track with a metallic rattle as the reels spin and stop and laboratory hardware surrounding the grid. All pretty grim so far, but can your bankroll make it into the future like these machines have? The disappointment really begins and ends here as yet again we have Netent's formulaic 'Max Win 500x bet' model we see with Starburst and that is achieved with a full screen of Wilds which are single on the reels but can be stacked up by the game's only feature as we shall see. 5-of-a-kind of these pay 25x our 20-coin stake for the 20 lines we play here on a standard grid of 5 reels and 3 rows. The remaining symbols are simply robots stacked 3 rows high in 7 different colours which pay 15x for Red, 6x Orange, 5x Yellow, 4x Green, 3x Blue, 2.5x Silver and 2x Bronze. That's pretty much it folks. On the right of the reels is a rickety-looking contraption with 2 electrodes on its head. Randomly it may 'zap' the reels with electricity as they spin and transform all occurrences of 1 to a maximum of 6 different coloured Robots on the reels and change them into Wilds. This is how any decent wins are created and where the chance of the maximum pay for a full screen of Wilds is enabled. The lamps on the Wild-O-Tron will light up with the 1 to 6 different colours it has transformed on the reels.